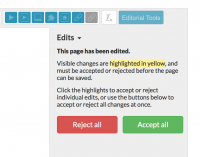 Editing pages or media with the Editorial Workflow enabled causes additional options to become available depending on your role and the current editorial state of the content. Pages and media both gain an Editorial Status row that enables you to change the current state of the content and its Usage Rights status, along with an extra save button at the bottom that will automatically move the content to the next state as it’s saved. Queries. Queries are notes between Authors and Editors to assist in communicating about editing tasks to be performed. Either an Author or and Editor can create queries on content they currently have permission to edit. Existing queries can be replied to or resolved by either party. Versions. Here you can compare any two versions of the current page to see the differences between them highlighted in yellow. Edits. When this section appears, you must either or accept or reject all of the changes made by the other party and then save the page before making any new edits. The sidebar includes options to accept or reject all changes instantly, or you can pick through each individual change in the text editor and accept or reject it. If changes have been made to the formatting of a media element or widget, options are provided to review and accept or reject those changes in a pop-up dialog box. Changes to metadata fields are not currently highlighted; you can use Queries or other communication to let team members know about these edits.